So far we’ve investigated primary medical research, specifically clinical research. We’ve reviewed both the experimental, or interventional, and observational, or non-interventional clinical research arms. Next up for review continues to fall under the medical primary research umbrella: Experimental epidemiological research (Fig. 1). Fig.1: Classification of different study types. Bernd, R., du Prel, J., Wachtlin, D., and Blettner, M. (2009). 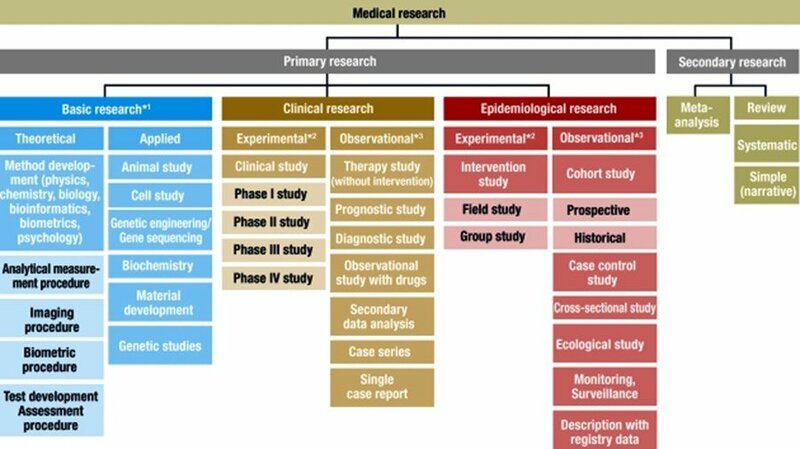 Types of Study in Medical Research. Deutsches Arzteblatt International, 106 (15), 262-268. Epidemiology is defined as “the study of the distribution and determinants of health-related states or events, including disease, and the application of this study to the control of diseases and other health problems (World Health Organization, n.d.). Epidemiological studies strive to investigate the distribution, history, and causative factors of disease frequencies in populations. Experimental, or interventional, epidemiological studies are similar to clinical experimental studies in their rigorous design and can be classified into 2 groups: Field studies and Group studies. Field studies take their study population from an area, such as a region of the country or globe. An example would be the study of post partum ovarian dysfunction in dairy cows in Belgium. Group studies derive their sample from a specific group, such a social or ethnic group. An example of a medical, primary, epidemiological, experimental group study is the introduction of conditions to alter self-injurious behavior in a cohort of those with developmental disability (Iwata, B.A. et al., 1994). Due to the rigorous nature of controlled interventional research design, some research topics do not lend themselves easily to epidemiological experimental studies for technical or ethical reasons. Luckily, in such a case a researcher can turn to observational epidemiological study design. Observational epidemiological research includes cohort, case-control, cross-sectional, ecological,monitoring/surveillance, and descriptive studies. In our next posting, we’ll tackle this long list and determine the key differences between each type of design. In the meantime, check out the Iwata, B.A. et al. (1994) research and see if you can pick out the features that define the work as an experimental epidemiological group study. Iwata, B.A., et al. (1994). The functions of self-injurious behavior: An experimental-epidemiological analysis. Journal of Applied Behavior Analysis, 2(27) 215 – 240. http://www.ncbi.nlm.nih.gov/pmc/articles/PMC1297800/pdf/jaba00008-0023.pdf. Opsomer, G., Grohn, Y.T., Hertl, J., Coryn, M., Deluyker, H., de Kruif, A. (2000). Risk factors for post partum ovarian dysfunction in high producing dairy cows in Belgium: A field study. Theriogenology; 53(4), 841-857.